Mother Louise Patterson and Bountiful Blessing Ministries, Inc. will record what will probably be the Christian Project of the Year! 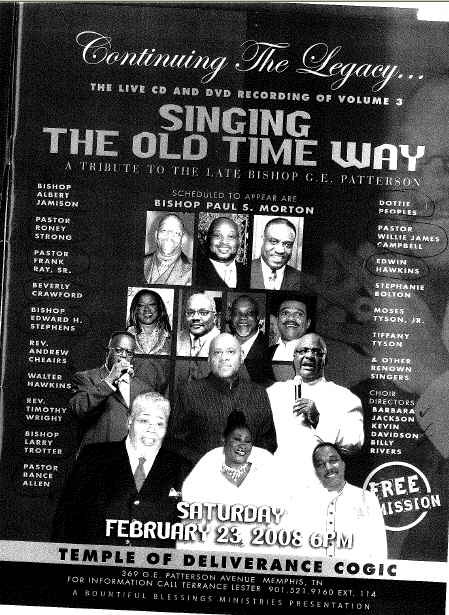 She will present Singing the Old Time Way, a tribue to the late Bishop G. E. Patterson! This project will be a live recording on Saturday February 23, 2008 at Temple of Deliverance Church of God in Christ in Memphis,Tennessee. The church is now pastored by The Superintendent Milton R. Hawkins. The doors will open at 6 P. M. and this event is free to the public! The following artists are slated to appear Bishop Paul S. Morton, Bishop Larry Trotter, Bishop Albert Jamison, Bishop Edward Stephens, Pastor Rance Allen, Pastor Timothy Wright,Pastor Roney Strong, Pastor Frank E. Ray, Sr. , Beverly Crawford, Rev. Andrew Cheairs, Walter Hawkins, Pastor Timothy Wright, Dottie Peoples, Pastor Willie James Campbell, Edwin Hawkins, Stephanie Bolton, Mose Tyson, Jr., Tiffany Tyson, and other reknown singers! The choir directors will be Barbara Jackson, Kevin Davidson, and Billy Rivers! This is sure to be an awesome project! Click the image above to access the full flyer for this event!